Our Foundation recently wrapped up their annual Employee Giving Campaign. We are so proud of the WCS staff, who donated $14,765! The staff cares deeply about the students, and their generosity will have a big impact on the quality of education that WCS can their students. WSF and WCS teamed up to purchase a set of VR Goggles so that every class will have the opportunity to experience a virtual lesson or field trip. We are proud of our WCS staff and our community for always coming together to support the children. You can keep up with our Foundation at WilmingtonCitySchools.com/foundation where you can also find WHS Alumni information. The Wilmington Schools Foundation is proud to announce that it will fund more than 22 Foundation Grants that fund educational endeavors for all schools and is one of the largest grant investment in the history of the WSF—over $24,000.00. Every Middle school student will get to go on a Field Trip. To enrich their education outside the school environment. The Wilmington Schools Foundation presented the 2017 Williams Excellence in Teaching Awards on May 26 at the Teacher Recognition breakfasts at each school. The Williams Award was established in 1996 by the WHS Class of 1945. It honors the memory of two devoted teachers, Woodrow and Esther Williams, who dedicated their professional lives to excellence in education. The awards are given each year to teachers who reflect the enthusiasm, dedication, preparation, and inspiration the Williams exhibited. This year’s winner included Erin Henry, MH teacher at the Holmes Elementary; Mitch Hopf, Science teacher at WMS who has been with the district for 13 years; and Steve Reed, library/ Media teacher at WHS, for 17 years. The Principal at Holmes Elementary, said “Mrs. Henry is always calm, positive, and Caring. She takes the time to get to know her students, their individual needs and plans for specialized instruction.” According to the Principal at WMS, “Mitch is diligent about meeting deadlines, has a positive rapport with students, and outstanding classroom management..” Mindy McCarty-Stewart spoke highly of Mr. Reed saying, “He was instrumental in implementing the 1:1 Technology program.” In addition to a certificate, each teacher is awarded $100 for use in his or her classrooms. If you would like to help keep this tradition going, please feel free to include a donation to the Williams Excellence in Teaching Award with your membership dues. Mrs. McGee's Preschool classroom at East End Elementary, received a foundation grant, called "Listen and Learn." A listening center equipped with headphones, a book and book on CD. During free choice time students have the ability to listen to stories that have been read to them previously during story time by the teacher. It's a great way for students to practice and enhance their retelling, comprehension and overall early literacy skills. Students in second and third grade at Denver Place Elementary, got to stay after school for a Book Club on October 4. They read the book, Dear Mrs. LaRue letters for Obedience School. Students had hot dogs for a snack and made dog crafts. This Book Club is made possible by a Wilmington Schools Foundation grant. Want to help make more grants like this possible? Donation to WSF today! 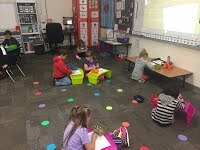 Mrs Reavis, Kindergarten classroom at Holmes Elementary received a Foundation Grant for flexible seating. What is flexible seating you might ask? This allow students to choose the best working space for them and allows them to move and wiggle while they work. Wobble cushions can fit into a regular chair allow moment while sitting or they can be used as cushion on the floor for kneeling or sitting. Lap trays will allow students to work on floor in a location that perfect for them, such as a quiet space or a place with more wiggle room. Bouncy bands stretch between the front legs of a classroom chair and allow students to bounce their legs or students can push or pull against the band to create resistance.